In “The National Reading Panel and the Big Five,” I introduced you to the origins of “The Big Five” essentials for reading. Today, I am going to discuss the first of the “Five,” which is Phonological and Phonemic Awareness. This area is so important to remediation, that I will cover it over two blogs. It is the foundation upon which all the other layers are built and, unless it is solid, the other layers will most definitely suffer, and the student will struggle to read. Phonological and phonemic awareness is, of course, the core deficit for dyslexic students, and the most common cause of poor reading. That said, these difficulties can be preempted and corrected before the child starts reading, but before we go any deeper into this topic, I need to define phonological and phonemic awareness. Phonological awareness: The ability to recognize and manipulate the sound properties of spoken words, such as syllables, initial sounds, rhyming parts, and phonemes. Phonemic awareness: The ability to recognize and manipulate individual phonemes in spoken words. Phonemic, or phoneme awareness is crucial to reading, and the other skills of phonological awareness, mentioned above, are its foundation. The order in which phonological awareness is developed is a complex subject, and I find myself tweaking it from time to time. The most important thing is to lay the foundation for phonemic awareness to be developed through rhyme, words, syllables, and alliteration and initial sound work. Later in this blog, I will talk about my current preferred order, along with some examples, but first we must define a phoneme. Phoneme comes from the Greek word, phonos, which means “sound” or “voice.” To quote David Kilpatrick again, “A phoneme is the smallest unit of sound in a spoken word.” Written letters represent the phonemes in our spoken language. Phonemes and letters are not the same; phonemes are the oral sounds while letters are a written representation of those sounds. It is really important that children understand that phonemes are the smallest parts of oral words, whereas letters are the smallest parts of written words. 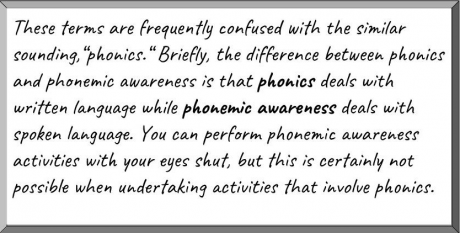 It is worth repeating: Phonemic awareness is crucial to reading, and the other skills of phonological awareness are the foundation for phonemic awareness. Now I will lay out my current order so this foundation can be developed. I will also mention the order in which I personally introduce phonemic awareness, once the foundation is in place, and I will discuss this in greater depth in part 2 of this blog. Rhyming: Words that have a similar sounding oral rime unit, for example “cat” and “mat,” “bear” and “flare.” Children can be asked if two words rhyme, or select from a group of three words, which one doesn’t rhyme. Lastly, they can be asked to supply words that rhyme with those being presented. If a child is experiencing difficulty, the last two concepts may be presented later, after some of the activities below. A parent recently shared with me that when her daughter was becoming distressed when trying to figure out whether two words rhymed. She hit on the idea of asking her daughter to think about whether her mouth moved in the same way as she said the end of each word, and also to feel her lips. These two tips really helped. Segmentation of words in phrases and sentences: Before breaking sentences down into words, students should practice repeating single words, and then short phrases. Starting with three-word phrases or sentences and moving up to sentences with seven words, children are asked to repeat the sentence, and then figure out how many words are in that sentence. If they have difficulty, cubes or counters can be used as manipulatives. For students who want to treat each syllable in multisyllable words as individual words, I use different colors or types of counters for syllables, to those which I use for words. This way, if the child has mistakenly selected word-counters for each syllable, it becomes a teaching opportunity, as the teacher or parent can go through the sentence again and discuss the multisyllable words. Then, together, they can exchange each group of syllable counters for a single word counter. Alliteration and Initial sounds: This is word play that involves words sharing the same initial sound. 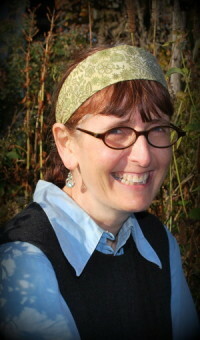 An example would be, “Annie Apple and the ants.” Children are asked which words have same beginning sound. The teacher or parent can repeat the beginning sound after the child has identified the correct words. 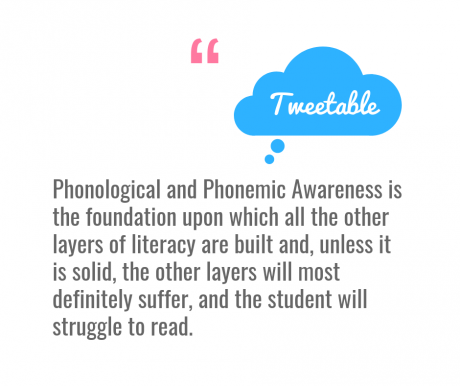 Onset-Rime: This is where development charts of Phonological Awareness tell us phonemic awareness starts. I will define this term for you. ● Onset: The onset in a syllable is any consonant sounds that come before the vowel. In “cat,” the onset would be ‘c’ making a /k/ sound. ● Rime: The rime in a syllable includes the vowel and any consonants that follow it. In “cat,” the rime would be /at/. He starts with a deletion of syllables, then works on onsets and rimes, and then moves on to substitutions of both. His Phoneme Level covers manipulation of initial phonemes, then deletion of ending phonemes, onto substitution of phonemes, and finally working on reversal of phonemes. For teachers and parents not following this program, the following may be helpful, I will cover these in greater depth in part 2 of this blog. Part 2 will also include more resources, including assessment and curriculum materials for teaching phonological and phonemic awareness. 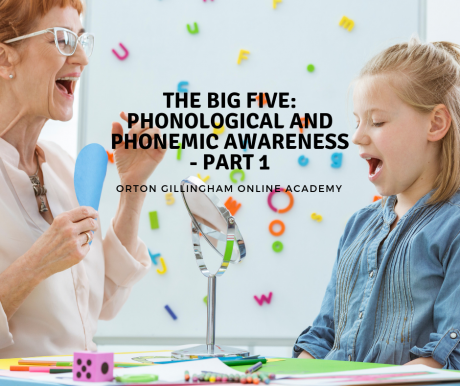 For further information about phonemic awareness, the Orton-Gillingham Online Academy offer a free webinar on this topic. 4. Great Leaps Language Growth Phonological Awareness and Language Activities by Kenneth U. Campbell.